My number one beauty pick for 2015 would have to be the Tarte Amazonian Clay Full Coverage Foundation. I did mention this baby in my October Favourites post but it was definitely a favourite all year round, and I actually have it in two shades- Fairly Light Neutral and Fairly Light Beige. If you want a medium to full coverage foundation that lasts pretty much all day long while still being lightweight and natural in finish, then this should be your go-to foundation. It does have quite a thick mousse like consistency but don't let that put you off as you can blend it out to be quite sheer if you prefer. It also has a large shade selection which is great for all you pale skin gals out there like me! I also find this foundation great for my oily skin and only has minimal separation by the end of the day. Also mentioned in my October Favourites that re-appear here are the Mecca Cosmetica Soft Focus Primer and the Lorac PRO Palette. I rambled on quite a bit about both products in that post so I will spare you the ordeal again, but can I just say I can't live without either product - for realzz. I used them pretty much on the daily in 2015. No 2015 faves post would really be complete without a mention of some form of highlighter - 2015 after all was all about dat glow after all. For me, the stand out has to be the BECCA x Jaclyn Hill Shimmering Skin Perfector in Champagne Pop. Possibly one of the most sought after highlighters this year it is worth every bit of praise that it has received thus far in my opinion. I have only been using this since I purchased it on my Hawaii trip but holy wow it was definitely love at first sight let me tell you. It such a lovely buttery consistency and it applies like a dream. As for the glow? My cheek bones literally pop but not in an overly sparkley glittery fashion but more like eau natural shimmer. I was a bit worried that this would be a bit too golden for my pale skin but it is quite universal and has a lovely peachy undertone. If you have yet to get your hands on it please remedy your situation on the ASAP - you can thank me later. While I am all about that glow I also rather enjoy a matte finish for my skin. To achieve that, I have been using the Rimmel Stay Matte Pressed Powder in Translucent. I previously would use MAC Studio Fix Press Powders to set my make-up but since using this gem I no longer use the MAC powder on the regular. For it's price I will continue to use it over the Studio Fix powder because to me the Rimmel powder is very very close to being a (much cheaper) dupe. My only gripe is the packaging, I absolutely hate it but it is a small thing to overcome considering how much I love the product. This year I really started getting into brows (and I guess along with the rest of the world really!) and after trialing many many different brow products and being rather late to join the ABH bandwagon, I can now say with complete faith that the Anastasia Beverly Hills Brow Wiz has to be one of the best products out there. I have this in two shades, Chocolate and Dark Brown and I just love it's fine tip which allows you to easily and precisely shape and fill in sparse brows. I also find that this product lasts quite a while so it is definitely worth the price. My favourite type of eyeliner has to be liquid and this one has to be my all time favourite. I have tried various high end and low end liquid eyeliners but I always seem to come back to my Stila Stay All Day Liquid Eyeliner. It glides on easily and is super easy to use. The tip is quite fine and doesn't fray or become blunt like some other eyeliners do. This also has amazing staying power. As someone with oily lids it is extremely hard to find a liquid eyeliner that does not budge AT ALL - and this ladies and gents is the one, it quite literally stays all day. I have a few lip products that I found myself reaching for this year. My two favourite lipstick picks are MAC Lipstick in Velvet Teddy and Lorac Alter Ego Cream Lipstick in Duchess. Both lipsticks are gorgeous nudes in their right, Velvet Teddy being a bit more on the brown side and Duchess a slightly more dusty rose. My favourite lip balm type product this year is the Dior Addict Lip Glow Balm - the packing itself is simply beautiful and so is the product! For me it is incredibly moisturing and leaves the lips with a natural tint, it does feel a tad waxy but nothing too annoying. Now on to skincare! Pixi by Petra was finally made available in Australia recently and I am ever so glad. After hearing about the Pixi Glow Tonic being raved about by the likes of Estee Lalonde and Caroline Hirons I have been itching to get my hands on it for yonks. It is a lovely gentle chemical exfoliant that contains Glycolic acid. It is definitely not on the same level as Alpha-H Liquid Gold or the FAB Radiance Pads it terms of exfoliating power but it is great for sensitive skin and I find can be used on my skin more regularly. I will post a full review on this product in future but ever since using this product my skin is soft, more refined and definitely has less breakouts. My two skin saviors this year have been the Aesop Parsley Seed Cleansing Mask and my RosehipPLUS Certified Organic Rosehip Oil. This mask does an amazing job when your skin needs a little bit of a pick me up if it feels a bit greasy or troublesome. And believe it or not, my Rosehip Oil has helped me combat my overly oily skin while also keeping it hydrated and plump, especially in the winter months. I recently started using Rosehip Oil religiously due to where I work but I am not being biased at all when I say this has helped my problem skin get back on track. Who knew the answer to combating oily skin was with (good) oils huh!? Using this mask and following with the Rosehip Oil is honestly one of may favourite skincare combinations at the moment. Whew! 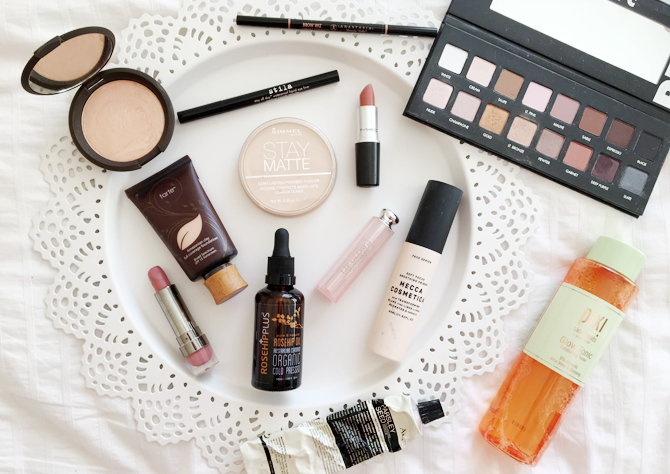 That's my 2015 beauty favourites in a nutshell! What's on your favourite beauty list of 2015? Do you see any of your faves here? So many amazing products here! I am DYING to get my hands on the Lorac Pro Palette and I'm so sad I don't have it, haha. I was never really that fussed about it until a friend who has it stayed over and I asked her to bring it with her. As soon as I used it, it immediately went on the wishlist! I thought it was just like any regular neutral eyeshadow palette, but there's such a lovely variety of mattes and shimmers, and cool-toned and warm-toned colours. I feel like it'd be such an awesome experience to be able to buy it in real life, but I don't know if I can hold out that long, lol. Definitely give the Kat Von D eyeliner a go when your Stila one runs out. It was my favourite in 2014, but the Kat Von D definitely became #1 for me last year. I don't know what it is, but my eyeliner is perfect every time I use it and I actually enjoy applying liquid eyeliner now! Love all the products that you've mentioned here! i'd love to get the Lorac Pro Palette so bad!!! The Stila Liquid Eyeliner and the Anastasia Brow Wiz are definitely some of my favs from 2015 too. I hope you had a great new year! Such amazing products! I still need to get my hands on the Aesop mask! Gah! Soon.... Also will be picking up the Pixi glow tonic (and other Pixi bits!) on my America trip where I can see it all in the flesh! Sidenote, very excited for your US haul for inspiration ;) Only got Champagne Pop a couple of months ago but the GLOOOOOW. The Lorac palette is beaaautiful, I just don't use eyeshadows enough to validate the purchase. The Aesop masque and Pixi glow tonic were definitely two of my favorite skincare favorites, mix in the Sunday Riley Luna oil and that was my set trio for the year! All those products look gorgeous, where did you get that pixi glow tonic from? Pixi is such a difficult brand to get in Australia.